The buquet must consist in at least a flower! We offer free shipping in Bucuresti, Cluj-Napoca, Constan?a, Bra?ov, Baia Mare, Targu Mures, Oradea, Bistrita, Arad, Calarasi, Covasna, Resita, Buzau, Craiova, Galati, Giurgiu, Targu Jiu, Miercurea Ciuc, Hunedoara, Piatra Neamt, Slobozia, Iasi, Drobeta Turnu-Severin, Piatra Neamt, Sibiu and other 40 cities form Romania. To find out the transport cost to your desired destination, please enter the city name and then select the date and time slot of delivery. Add to cart and proceed further with submitting your online order. When you are sending flowers, we will include your personal message hand-written on a note card. Be sure to include your name so your recipient knows who is sending the gift. It is not always easy to write a heartfelt message that expresses how you feel, so we have written some card suggestions for different occasions. Our flowers are shipped fresh from the growers to you or your recipient's doorstep. We carefully select premium flowers directly from the farms of Colombia, Ethiopia and the Netherlands. We will never compromise on your flower's freshness or longevity. For this reason, some flowers will arrive with their buds closed so they can begin opening on arrival. Same-day flower delivery is available every day. All you have to do is place your order before the following times: 6:30 PM for deliveries in Bucharest, Cluj-Napoca and Targu Mures; 4:30 PM for deliveries in the rest of the country. Magnolia aims to ship in 2-4 hours from order submission in the majority of the country. Should you prefer a more precise time of delivery you can mention it on the next order page in the "Other informations" field. Please note that we will do our best to meet your reuirements, however we guarantee delivery within the initial timeframe. If the recipient cannot be found at the indicated address, we will contact him/her in order to rearrange the flower delivery. Magnolia delivers flower bouquets Monday through Saturday in more than 150 countries worldwide. We aim to ship within one working day from order submission. 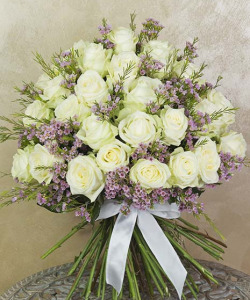 To deliver flowers abroad please visit the International section located at the top of the page. Orders can arrive at the recipient's doorstep on the date you have chosen any time between 8:00 AM and 8:00 PM. If the recipient cannot be found at the indicated address, we will contact him/her in order to rearrange the flower delivery. Our online security system is built for your protection and is one of the safest in the industry. We continually enhance our systems to ensure your shopping protection and satisfaction. All of your transactions at Magnolia are covered by our security guarantee. We use a secure server software encrypts all of your personal information including credit card number, name, and address, so that it cannot be read as the information travels over the Internet. For details on available payment alternatives on Magnolia, please visit the "How to pay?" section. Carefully selected vases to match the shape, height, diameter and structure of your flower bouquet. Enter destination and delivery date, then take your pick! You can choose the gift in the next step, after you add your product to cart, gift that may be a bottle of champagne, send the hug of a teddy bear for those feeling under the weather or sweeten her day with a box of chocolates. Choose the perfect present to make their birthday unforgettable, or just because. Because details matter, we show you every detail of our bouquets. 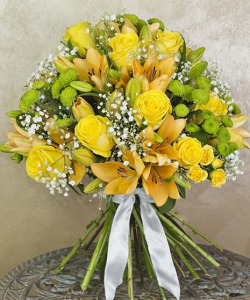 With our 360 degree videos, you can easily admire the whole bouquet. Red tulips are the symbol of love, and the white ones are a sign of appreciation. A combination of the two colors is perfect when you want to surprise your loved one. 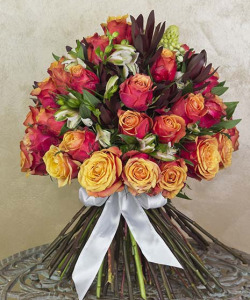 Order this bouquet of tulips online and send it to someone you love. It will reach the destination in no time duet o our service of flower delivery in Romania. Any order can be delivered together with a FREE customized greeting card with your message filled out in the order form. 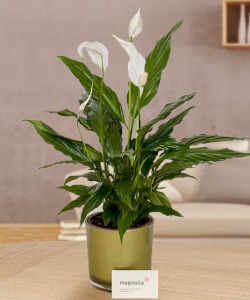 This product can be paid online through credit/debit cards, bank transfer, Western Union or cash at any Magnolia Flower Shop from Romania. There are no reviews. Add one.